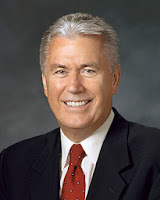 President Dieter F. Uchtdorf (born November 6, 1940) served as a Seventy from 1994-2004, when he was called as a member of the Quorum of Twelve. He has served as second counselor in the First Presidency since 2008. "As Saints of the Most High God, we are to 'remember in all things the poor and the needy, the sick and the afflicted, for he that doeth not these things, the same is not my disciple' (D&C 52:40). Opportunities to go about doing good and to serve others are limitless. We can find them in our communities, in our wards and branches, and certainly in our homes. "In addition, every member of the Church is given specific formal opportunities to serve. We refer to these opportunities as 'callings'—a term that should remind us of who it is that calls us to serve. If we approach our callings as opportunities to serve God and minister to others with faith and humility, every act of service will be a step on the path of discipleship. In this way, God not only builds up His Church but also builds up His servants. The Church is designed to help us become true and faithful disciples of Christ, good and noble sons and daughters of God. This happens not just when we go to meetings and listen to talks but also when we get outside ourselves and serve. This is how we become 'great' in the kingdom of God. "We accept callings with grace, humility, and gratitude. When we are released from these callings, we accept the change with the same grace, humility, and gratitude. 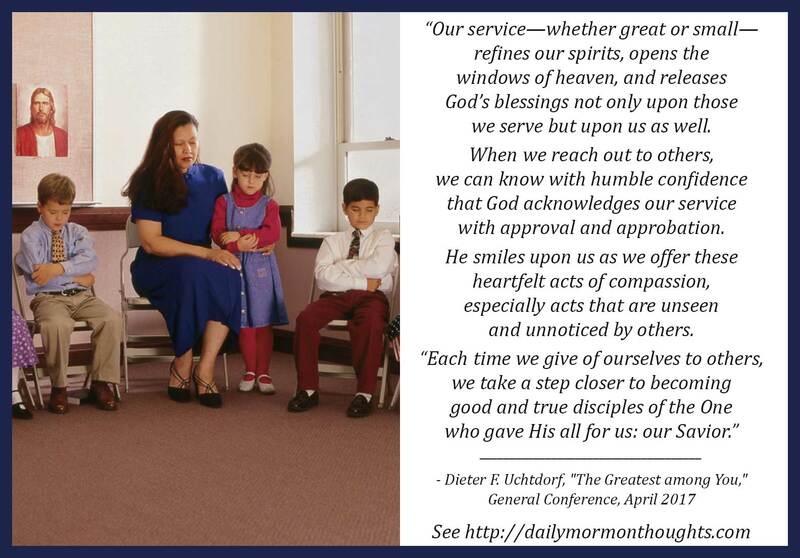 "Each time we give of ourselves to others, we take a step closer to becoming good and true disciples of the One who gave His all for us: our Savior." In his address to the Priesthood session of the recent general conference, President Uchtdorf gave some wonderful reminders of the importance of service to others, including Priesthood service but also more broadly, the blessings that come as we serve in a variety of ways. Noting that there are so many ways for us "to go about doing good" in our lives, he encouraged us to seek for them more actively. This section on callings in the Church was insightful. President Eyring promises that "every act of service will be a step on the path of discipleship." As we are invited to serve in specific assignments, God not only builds up the kingdom, but also His servants, helping us each to "become true and faithful disciples of Christ, good and noble sons and daughters of God" as we follow the Savior's example of humble service to others. The scriptural injunction to "magnify" our callings in the Priesthood (D&C 84:33) applies in all cases. To magnify is to enlarge or increase. As we are invited to participate and contribute, blessings come to others when we seek to increase the good we do at any level of service; and in the process, we become better disciples as God's favor is given to the humble servant. Labels: church, service, Uchtdorf Dieter F.